As you may recall from the first part of this series, Maurice Halbwachs wrote an important and detailed treatise on social memory and its relation to memorialized places (les localisations), which he called The Legendary Topography of the Gospels in the Holy Land: A Study of Collective Memory (La topographie legendaire des evangiles en terre sainte: Etude de memoire collective). In it, he chronicled the succession of Christians who memorialized various key places in Palestine: Nazareth, Bethlehem, Jerusalem, etc. Pilgrims, as well as those who could only imagine those places, combined the shared memory of events in the gospels with the ritual observance of those events within the social framework of their religion. 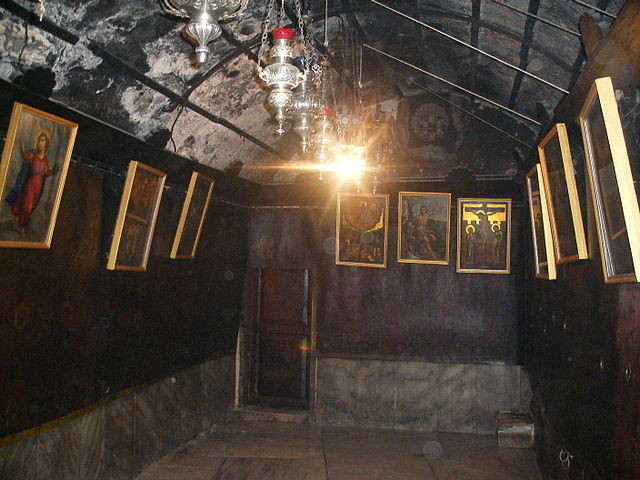 Grotto of the Nativity, west part. Bethlehem. If you’ve ever wondered what a “secular historian” might think of what we’re doing here in the inner sanctum, this is the book for you. While busy with his Abraham Lincoln monograph series, Professor Schwartz has become conversant with historical Jesus research and New Testament studies in his “spare time” over the past ten years. Schwartz has deep roots in sociology and is (without rival) the leading voice of social memory theory in the English-speaking world. — because Schwartz was not simply saying he disagreed with Halbwachs, but he essentially accused him of scholarly malpractice. More than that, I found it provocative because I believed Schwartz was utterly wrong. However, I had not consulted those earlier chapters in La topographie legendaire, and perhaps I had missed something. An expert sans peer must have read these preliminary chapters since they are, after all, aimed at experts. So I ordered the book last month and began reading — slowly, of course. The last time I studied French was in high school, and that was nearly 40 years ago. Recall that the supposed dismissal of the Nativity in Bethlehem as a legend sparked Schwartz’s tirade, so we should investigate what Halbwachs said about it in his chapter on Bethlehem (Halbwachs, 2008, pp. 50-63). Actually, we need look no further than the introduction, in which the author quotes Ernest Renan (see below: Renan, 1864). On the road, on the right hand, is a tomb, in which lies Rachel, the wife of Jacob (Gen 35:19-20; Matt 2:18). Two miles from thence, on the left hand, is Bethlehem, where our Lord Jesus Christ was born (Matt 2:1; Luke 2:1-7). A basilica has been built there by the orders of Constantine. Not far from thence is the tomb of Ezekiel, Asaph, Job, Jesse, David, and Solomon, whose names are inscribed in Hebrew letters upon the wall as you go down into the vault itself. Here we see the contrast between the results of critical, historical scholarship — whose consensus position regarding the birth of Jesus still overwhelmingly favors Nazareth — and Christian collective memory, which well before 333 CE had accepted Bethlehem as the obvious place of the birth of the Messiah. Gustaf Dalman, upon whom Halbwachs relies heavily, writes in Sacred Sites and Ways: Studies in the Topography of the Gospels (1935), that some writers thought Jesus’ actual birthplace was not in Judea, but in Bethlehem of Zebulon, which lies 12 miles to the north of Nazareth. And Halbwachs reminds us that in the gospels of John and Mark, Bethlehem is not even mentioned. I remembered this old Provençal Christmas carol when I was in Bethlehem. I went in a car. What does one see in the car? At the Church of the Nativity, we went down by one of the two spiral staircases of fifteen steps, in the underground church under the choir. It is irregular, because it occupies the site of the Stable and the Crèche. It is cut into the rock. The floor and walls are covered with marble. The place of the Nativity is marked by white marble inlaid with jasper, and surrounded by a silver disc, radiating in the form of the sun, round about which we read: Hic de Virgine Maria, Jesus Christus Natus est. It is one thing to learn and accept the belief that God became flesh and died for your sins. It is quite another to experience the location of Golgotha and to feel the certain knowledge in your heart that this is the place where Jesus died. I’m not sure what to make of Schwartz’s hostility and ignorance. As we noted earlier, Halbwachs drew clear distinctions among the three disciplines at work here. First, how the disciples’ recollection of events may have been distorted over time is a question about individual memory. Such distortions refer to the capacity of humans to remember, while recognizing our limitations with respect to observation, encoding, and retrieval. Second, historical memory attempts to describe the past “as it essentially was.” Critical historical scholarship in the New Testament seeks to discover what Jesus and his followers probably said and did. The third discipline, social memory, was Halbwachs’s main concern. Hence, the historicity of locations and the events Christians believed took place there remain secondary. That’s because social memory is not “an inferior version of history,” but something else altogether. Halbwachs cared about what Christians at different times thought about the sacred places in the “Holy Land,” and how their religious beliefs informed those thoughts and feelings. He was not “confining himself to the landmarks,” but to the people and how they used those landmarks as social frames (les cadres sociaux) upon which to interpret their memories. Contrary to Schwartz, Halbwachs never argued that the landmarks are the “primary source” of Christian origins. He was not interested in their “capacity to distort,” but rather, in their usage as reinforcements of already-held beliefs. It is one thing to learn and accept the belief that God became flesh and died for your sins. It is quite another to experience the location of Golgotha and to feel the certain knowledge in your heart that this is the place where Jesus died. The locations pilgrims visited in ancient times and continue to visit today tie theological, transcendent beliefs to concrete, temporal locations. In other words, they turn thoughts into personal reality. Nevertheless, Halbwachs did accept the scholarly consensus that the Bethlehem story is not historical. Halbwachs theorized that early Christianity needed to link its memories to the locations of earlier Jewish memories in order to legitimize itself. Christianity appropriated the memories of Judaism and transformed them into indicators of the Messiah. Even non-prophetic works in the Hebrew Bible became sources for prophecies of Jesus. Moreover, the New Testament events that occurred at various sites in Jerusalem now overshadowed the long history of kings, priests, people, and prophets. Christians also embraced landmarks in Jerusalem that had no Jewish ties. Did the early Christians find the real sites of the Praetorium, of the Cenacle, of Golgotha? Were they historically authentic? We’re not doing archaeology here. Such questions matter to the scholar of social memory only insofar as it helps explain the thoughts and behavior of Christians over time. For Halbwachs, to focus simply on pointing out inconsistencies in accounts or in noticing that some stories are legendary (while others are not) would be missing the point. And so, returning to Schwartz, was the founder of social memory interested only in a “pejorative conception of collective memory“? Did he not “fully grasp what sacred sites accomplish“? For Halbwachs, to focus simply on pointing out inconsistencies in accounts or in noticing that some stories are legendary (while others are not) would be missing the point. He wanted to understand why Christians chose certain sites, how they commemorated events at those sites, and what those locations meant to the people who remembered them. To condemn Halbwachs as the practitioner of a science that “finds its triumphant moments in clever reinterpretations or the debunking of what was once believed to be true” (Schwartz, 2005, p. 46) more than misses the point. The holy sites of Christianity are relics of human societies. They hint at the beliefs, hopes, dreams, and aspirations of our forebears. I’ll let Maurice Halbwachs have the last word. Posted on 2014-12-26 09:13:45 GMT+0000 by Tim Widowfield. This entry was posted in Biblical Studies and tagged Barry Schwartz, Ernest Renan, Memory Mavens, Social Memory. Bookmark the permalink. You’ve forced me to try to track down and read Schwartz, though I’m not looking forward to it. Isn’t it funny how theologians are happy to accept the research of experts outside their field when it supports their ideas, but are openly hostile and dismissive (“he doesn’t have a degree in NT studies, how can he know anything!”) when it doesn’t? Looking forward to future posts in this important series. His stuff on Lincoln is highly readable and useful. But he loses all perspective when he gets a whiff of “constructivist” social memory theory. And he suffers, I think, from his ties to modern NT scholars who hate form criticism and wish to blame it for all the world’s ills. The message of these posts deserves to be making its point felt more widely. I’d like to see a way for some memory-theory scholars respond to these arguments.